Madhya Pradesh bidding saw Smart Wireless Ltd taking over as Distribution Franchisee operator for all the three locations i.e. Gwalior, Sagar & Ujjain. They have been awarded LOI and have also accepted the same for all 3 regions. They intend to start the 3 months joint operations with DISCOM by second week of May, and takeover completely before 15th August. Recently, Jharkhand released RFPs for 3 cities namely Ranchi, Dhanbad and Jamshedpur. 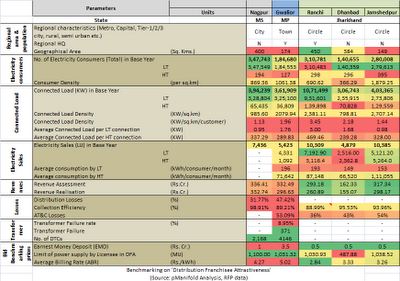 The below image provides a quick study on new Jharkhand RFPs and its comparison with old one's (Nagpur, Gwalior). It depicts the brief comparison of some critical Attributes, which includes Factors like Electrical Network and Health, Consumption Patterns, Geography, etc. A coloring scheme is used for better visualization for favorable Distribution Franchisee parameters across each attributes. MP bids took approximately 9 months from initial release of RFP in June,2011 till awarding of LOI of all the three locations in April,2012, with total 3 revisions in RFP in between. We hope that Jharkhand Government decision makers draws inputs from MP bids and expedites the awarding of locations by engaging all stakeholders. pManifold continues support Knowledge building in Power Distribution Franchisee model in India and help realise its potential. In continuous effort to scale Power Distribution Franchisee business model, pManifold has launched a 'Input Based Power Distribution Franchisee Market in India 2012Q1'. 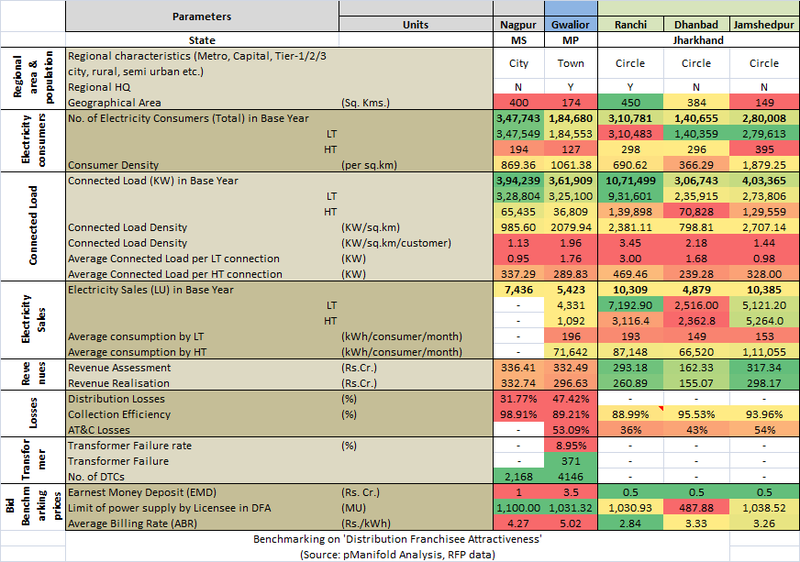 The report will provide detailed market, operational and financial insights into running a Power Distribution Franchisee. It will also include detailed previous bid analytics, including most recent from MP, future DF opportunities and trends. For more details and to download Executive Summary of our report, please see here. You can place your order with us at kunjan.bagdia@pmanifold.com.